Do you want to swim faster or learn how to swim correctly? To swim better or get started in swimming it is important to know how to do it right so you develop good habits. Learn how to swim effectively and improve your stroke. Underwater Video Analysis and Small Group Swim lessons will be offered for a limited time by Coach Lora Erickson aka Blonde Runner, a nationally ranked triathlete. Sessions are only offered periodically and there are limited spots in the class. Pre-registration is required to hold a spot. Contact Coach Lora at theblonderunner@gmail.com to learn how you can reserve your spot. Message Coach Lora to register for the next session or to learn more information. “I first met Coach Lora when I participated in her underwater swim analysis class. Although I grew up by the beach and swimming in the ocean, the pool was new to me. This small group class was held at the pool and she uses an underwater camera to film you. You meet a week later individually and she review your stroke and things to work on. My knowledge of good freestyle technique was limited, however, I worked on what I learned. Several weeks later, I had the opportunity to participate in the on land, lecture style swim-clinic. I really didn’t expect that a discussion format with film clips would make a difference, but to my surprise, the next time I went to the pool, I was like a new person in the water. More efficient and much faster, even in my board shorts. I highly recommend both classes individually, but the combination for me has helped a ton. Coach Lora is knowledgeable and enthusiastic and really cares about your progress individually.“ ~ Dr. Scott T., M.D. “Swimming has always been the weakest part of my triathlons, so I jumped at the chance to join Coach Lora’s swim clinic. She gave me some specific pointers right away, and I immediately felt a difference. She took video footage of me from multiple angles, and when we got together the next week to review, I was able to really understand what she was talking about. There are so many technical aspects involved in swimming, but Coach has been incredibly patient with me (helping me be patient with myself! ), and helped me to focus on one at a time until I can start combining them. I especially appreciate how well she explains ideas and techniques–trying many different directions until I finally figured out which one clicked for me. That “Aha!” moment was worth every penny spent and every minute in the water.” ~ Melanie M.
“The swim clinic is for you if you want to learn the best techniques in swimming to improve your stroke, speed, and efficiency in the water. I considered myself to be a pretty good swimmer, but it’s amazing the difference Coach Lora has made in my swimming. She analyzes every part of your swim stroke, shows you on film what you’re doing, and then provides very specific and personalized instructions that maximize your swimming. One of the most helpful things to me was that she taught the same concept in different ways until she saw me doing it the right way. She’ll explain things over and over again until it’s engrained in your brain.” – Tracy D.
“Underwater swim video analysis with Lora has helped me improve my form so much. Seeing the underwater video of me swimming was not only fun to watch, but it really helped Lora and me see what I was doing well, and where I needed improvement. After a couple of sessions with Lora, I really worked on incorporating the suggestions she gave me, and recently, as part of my training, she had me swim a timed 750 meter effort. I turned out the fastest 750 meter split I have ever swum, racing or training. Now I can’t wait to get out into the open water to swim with a wetsuit! 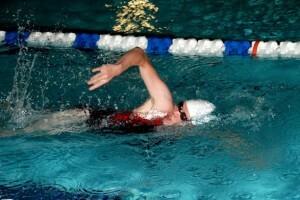 Thanks Lora!” ~ Chris W.
“The swim video analysis was very helpful. It was especially nice, after having had two shoulder surgeries and not having a swimming background, to have some direction on simple things to do to improve my form. I would recommend it to anyone who is looking for some great coaching advice to become a better swimmer.” ~ Emily H.
“I loved the video analysis because I could actually see what I was doing wrong. It was definitely worth the money and time. Thanks so much Coach Lora! “ ~ Brit. G.
“I just did my first two swim workouts after the swim analysis. Yesterday and today, I finally get what I’m supposed to do. I’m SO EXCITED because it felt like it really clicked today. I worked hard on stretching between strokes and I’m happy to report that I shaved four seconds off my 50 meter time just by making a few tweaks. There’s still a lot of work to do, but I felt like I finally found the sweet spot I’ve been looking for. Now, I just have to un-train my body from the ineffective swimming it’s been doing for the last 25 years.I thought the swim analysis was VERY beneficial. It really helped to see what I look like when I’m in the water. It’s hard to visualize what you look like when you’re swimming, but I could see instantly how inefficient my swimming was in the video.I look forward to faster swim times.” ~Sandra H.